Today’s wallpaper features Gemini North, the Mauna Kea branch of the Gemini Observatory. Like Gemini South on the summit of Cerro Pachon in Chile, the observatory at Gemini North houses an 8.1-meter diameter optical/infrared telescope. Together, North and South are capable of surveying the entire night sky with an array of instruments. In addition to star trails, the image above shows the trace the Laser Guide Star (the LGS creates an “artificial star” which is used as a reference source for the adaptive optics systems of the telescope’s various instruments) created on May 21, 2010. If you’re looking at the high-res wallpaper, you can see a similar LGS trace from the W. M. Keck Observatory in the lower left hand corner of the photo. The bright, wide streak at the far left of the image is the moon’s trail. 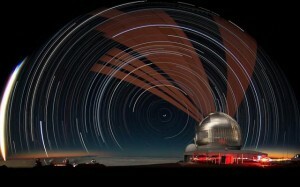 Several other Mauna Kea observatories and telescopes are also visible in the high-res image. From left to right, they are: the Subaru Telescope (looks like a tube set on end), Keck (the twin domes), NASA IRTF (behind which can be seen the peak of Haleakalā on Maui, rising from the clouds), and CFHT (just behind Gemini North).